The French Government has authorised a range of emergency powers in an effort to combat 12 nights of rioting. The move, announced by interior minister Nicolas Sarkozy, allows local authorities to impose curfews and lets police perform raids without warrants. The city of Amiens is the first to declare an overnight curfew, affecting unaccompanied under 16-year-olds. Prime Minister Dominique de Villepin has outlined to MPs an accompanying programme to improve social conditions. The nightly protests have gripped deprived areas with large African and Arab communities where unemployment is rife and residents complain of racism and discrimination. Measures announced by the prime minister include a jobs programme and funding for teaching in deprived areas. An agency will be set up with the aim of combating racial discrimination. "Our collective responsibility is to make difficult areas the same sort of territory as others in the republic," Mr de Villepin said. But he said the restoration of law and order to the country's largely immigrant suburbs would take time and hard work. "The republic is at a moment of truth," he said. "What is being questioned is the effectiveness of our integration model." Unrest continued on Monday night, although Paris saw a lull for the first time. 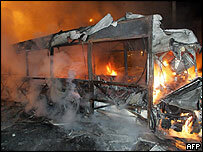 But across the country 1,173 cars were burnt and 330 arrests made. Twelve police officers were also injured. Amiens, in the northern Somme region, has become the first city to declare a curfew under the new powers, which were approved in a special Cabinet meeting on Tuesday morning. Minors will be subject to the law between 2200 and 0600 (2100 and 0500 GMT) unless accompanied by an adult, and are also banned from buying petrol. Two Paris suburbs, Savigny-sur-Orge and Raincy, as well as the historic city of Orleans, have already declared separate curfews not covered by the law. The emergency powers were invoked under a 1955 law and it is the first time it has been implemented in mainland France. The law was originally passed to combat violence in Algeria in its war of independence against France from 1954-62. It was also used in New Caledonia in 1985. Monday saw rioting in the southern city of Toulouse, where a bus was torched, and Lille in the north, where a creche was burned down and vehicles set alight. Two schools were also torched in the Nord-Pas-de-Calais and Picardie regions, north of Paris. In Paris, where on Sunday the violence escalated to the point where two police officers were shot and wounded, there was a night of relative calm. Some 17 cars were reported to have been burned overnight, but the BBC's Johnny Dymond said areas that had been at the centre of previous violence were virtually deserted. Locals said they were being chased by the police, but the police deny this.